A great deal of expensive equipment is not required to make 50 gallons of wine. 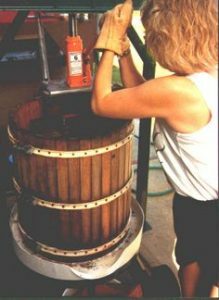 Grape crushers and wine presses can be rented by the day for a few dollars each. 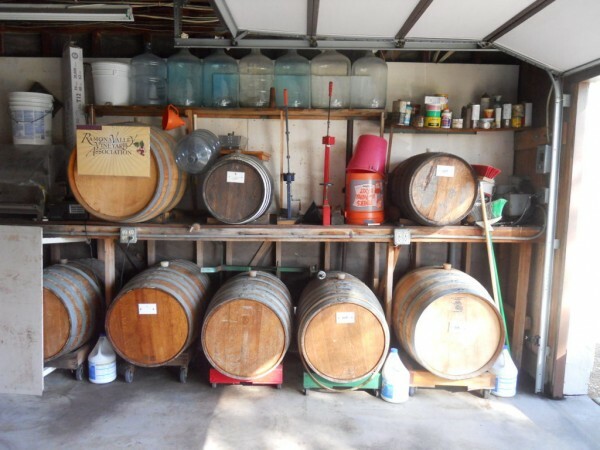 Used barrels can be purchased for less than fifty dollars, and the deposit on a 15-gallon beer keg is about fifteen dollars. Each year, home winemakers ferment large quantities of red wine in new 32-gallon plastic trash cans. Much of the equipment needed to produce small quantities of wine can be found around the home. Wine is measured by the case, and a case contains approximately 2.4 gallons of wine. Estimating just how much wine can be made from a ton of grapes is difficult. The amount depends upon the grape variety, the equipment used and the winemaking methods employed. Professional winemakers often get 160 to 180 gallons of wine per ton of grapes. Home winemakers working with small basket presses are doing well to get 150 gallons of wine per ton of fruit. One hundred and fifty gallons represent about 62 cases of wine. The price of a ton of grapes will depend upon the grape variety, the location of the vineyard and upon supply and demand. In 1994, Napa Valley Cabernet Sauvignon grapes sold for about $1200 a ton. Temecula Cabernet sold for around $600, and Cabernet grown in the Bakersfield area sold for less than $500 a ton. Representative prices for several varieties of wine grapes grown in southern California are shown below. Wine grapes are bought and sold by the ton. When home winemakers purchase fruit in 100 pound quantities, they often must pay a premium price. Grapes purchased by the pound often cost three or four times the per ton price. Table wine is a very perishable food product. Wine oxidizes quite easily, and wine is susceptible to attack by a variety of microorganisms. If wine is going to be stored for any significant time, it must be sealed in air tight containers and stored in a cool, dark environment. The standard “package” for quality wine consists of a 750-milliliter glass bottle, a standard 1 3/4 inch cork, a capsule and an appropriate label to identify the contents. The costs of the fruit and the costs of the package are the major out-of-pocket expenses for the home winemaker. Glass bottles are packed in standard cardboard cartons, and the glass is clean and sterile when it leaves the factory. Glass bottles are heavy, so shipping costs are high. Consequently, glass is normally shipped in truckload lots, and the quantities are quite large. Smaller commercial wineries often pool resources and buy a truckload of bottles to reduce their glass costs. This is why the home winemaker seldom has access to new glass. The average home winemaker really has only two alternatives. The winemaker must either “wash his own” or rely on commercially re-sterilized, used bottles. Commercial bottle washing enterprises usually charge $4.00 to $5.00 for a case of re-sterilized glass. Unfortunately, re-sterilized glass is usually hard to find, and sometimes it is not available at all. Ecovin has re-sterilized glass available for about $4.00 per case, but they are in the San Francisco Bay area, and shipping costs can be high. Standard wine corks are sold in large sealed polyethylene bags that contain one thousand corks. The bags are gassed with sulfur dioxide, and the humidity in the bag is carefully controlled. The corks are sterile until the bag is opened. Dry corks taken from a new bag are soft and pliable. They can be easily driven into a bottle. Corks quickly dehydrate and become hard after the bag has been open for a few weeks. Old, dry, hard corks are difficult to drive, and they are a terrible nuisance. Good corks sell for about $140 a bag. Capsules are purely decorative. Home winemakers generally use “push on” or “heat shrink” plastic capsules. Plastic capsules are shipped by the manufacturer in large cardboard cartons that contain about five thousand capsules. All wine should have a label permanently attached to each bottle to identify the contents. Custom wine labels are easy to make using a home computer, and very attractive labels can be made for a few cents each. However, full color labels, printed on heavy weight papers, often cost more than twenty-five cents each when they are produced in the small numbers needed by most home winemakers. The following example is given to illustrate possible home winemaking costs. Please note that the costs given in this example assume that the grapes and most of the winemaking supplies are purchased in commercial quantities. A ton of local wine grapes might cost $600 and produce 62 cases of finished wine. Here, the cost of the fruit needed to produce one case of wine would be $9.68. The cost of re-sterilized glass might be $5.00 per case, and corks might cost $1.50 per case. Label costs can range from less than $0.50 to more than $3.00 per case. However, pleasing labels can be made on a home computer for less than $0.60 per dozen. Plastic capsules cost from $0.40 to $0.60 per case. The cost of miscellaneous winemaking materials like acid, sulfite, etc. will depend upon the characteristics of the wine. An average cost of about $0.65 per case is a good estimate. The table below shows how per case wine cost depends upon the cost of the grapes. Note that the cost of the fruit and the cost of the package is about the same when $500 per ton grapes are crushed. When less expensive grapes are used, the cost of the package is the major cost factor. If “wash your own” bottles were used in the above example, the per case cost would be $5.00 less than the values shown. Obviously, these estimates do not include the original cost of winemaking equipment, and they do not include the cost of repairs, yearly maintenance, etc. Wine is very perishable, and table wine spoils quickly unless it is sealed in air tight containers. The standard package for quality wine consists of a 750-ml glass bottle, a 1 3/4 inch cork, a capsule and an appropriate label. The cost of homemade wine depends on the cost of the grapes and the cost of the package. The cost of the fruit and the package are about equal when $600 per ton grapes are used, but the package cost is dominant when inexpensive grapes are used. Home winemakers can reduce their winemaking costs by purchasing grapes by the ton and supplies in commercial quantities. Washing used wine bottles is another way to reduce home winemaking costs. Winemaking can be divided into four basic phases. The first phase consists of finding a source of high quality fruit and making sure the grapes are harvested in an optimum condition. Buying small quantities of high quality fruit is not easy, and this is the most difficult winemaking phase for home winemakers. The second phase consists of fermenting the grapes into wine. Winemakers manage the fermentation by controlling several different fermentation parameters such as temperature, skin contact time, pressing technique, etc. During the third phase, the new wine is clarified and stabilized. Winemakers clarify wine by fining, racking and filtration. Wine is stabilized by removing excessive protein and potassium hydrogen tartrate (potassium bi-tartrate). These materials must be removed to prevent them from precipitating out of the wine later. In the fourth phase of winemaking, the winemaker ages the wine. Most high quality wines are aged in bulk and then for an additional time in the bottle. Winemakers have an active role throughout the lengthy bulk aging process. Wines are smelled, tasted and measured every few weeks, and any needed adjustments are made promptly. Except for the first phase, the other three winemaking phases overlap each other. New wine starts to clarify toward the end of the fermentation period. Some tartrates precipitate out during primary fermentation, and the wine becomes more stable. Of course, wine is aging throughout the winemaking process. Each phase makes a specific contribution to wine characteristics, but the first phase has the greatest influence on wine quality. High quality, red wine grapes have colorless juice. All of the red color is in the grape skins, and winemakers must leave the juice in contact with the skins for a considerable time to extract the color. Red wine is made by crushing the grapes and then fermenting the juice, the pulp, the skins and the seeds together for several days. Near the end of sugar fermentation, a wine press is used to separate the liquid from the solid materials. White wine is made by a different process. First the grapes are crushed and pressed immediately to separate the juice from the solids. After pressing, the skins, stems and seeds are discarded, and the juice is cooled to a low temperature. Then the cold juice is allowed to settle for several hours, and the clear juice is decanted off the residue before it is fermented. White wine is made by fermenting clarified juice. These are the fundamental differences between making quality, red wine and white wine. At first glance, the two winemaking processes may appear similar because several steps are identical. Nevertheless, the steps are done in a different sequence, and the sequence makes a large change in wine characteristics. The two processes are shown in the Figure below.